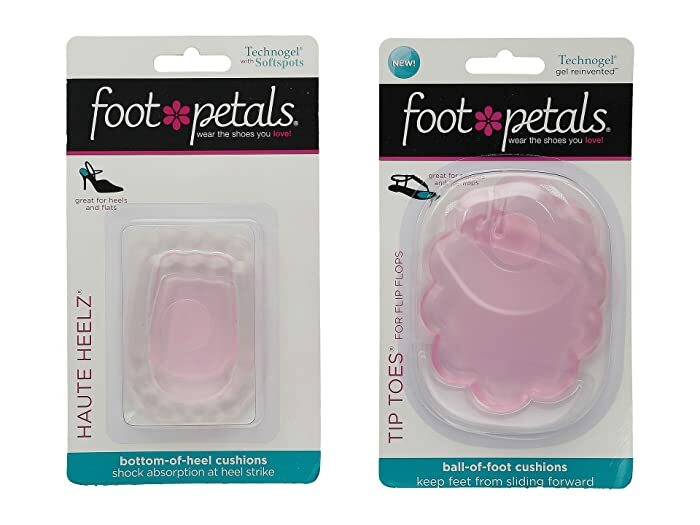 When your days are long don't give in to the pain, ease it with these Foot Petals® Sandal Kit. Comes with a set of Tip Toes® with slit for toe post and Haute Heelz®. This patented, revolutionary gel is like no other. Its 3-dimensional shock absorption reduces stress on pressure points to provide superior comfort with every step. These virtually invisible cushions contour to your foot and provide long-lasting cushioning that never goes flat! Great for sandals and flip flops. Haute Heelz® helps to prevent cracked heels. 2. Place the widest part of Tip Toes cushion towards the front of the shoe right below toes. Area must be clean and dry. Place Haute Heelz cushion towards back of shoe right below the heel.